Style: 2 Storey "Main Level Entry"
Comfortable Tahsis home with convenient level entry to main floor and 3 bedrooms on the upper floor for privacy. Nearly new roof! Fenced yard with a handy shed/workshop, too. Furniture can be included. 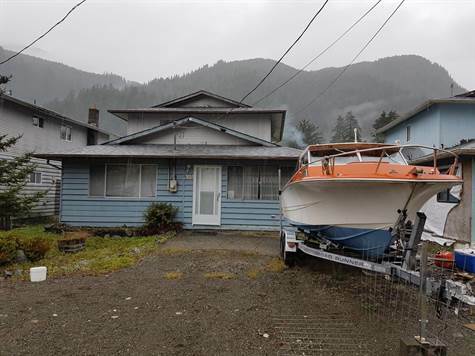 Boat may be negotiated separately. Discover West Coast living in Tahsis, BC. Tahsis is located 153 km from Campbell River, or 65 km from Gold River. An ATV trail is underway to connect Tahsis to Zeballos. Excellent fishing, canoeing and kayaking in Nootka Sound. Wildlife abounds. Many caves to explore nearby. The Village of Tahsis has a store/liquor store/gas station, hardware/building supplies store, ambulance station, health unit and doctors' office, restaurant, cafe, marina, school and much more. A great place for a getaway, retirement, or to raise a family. Information is not guaranteed and must be verified if important.